TLAW is proud to share with you this following event. TLAW Nominating Committee Announces Slate for 2018-2019! In accordance with Article XV, Section 1(b) of the Bylaws for the Tennessee Lawyers' Association for Women, the Nominating Committee hereby publishes its nominating report. Karen G. Crutchfield, Chair, Nominating Committee and President; Holly Renken, President-Elect; Ramona DeSalvo, Immediate Past President; Crista Cuccaro, Corresponding Secretary; Cheryl Rice, Empowerment Conference Co-Chair & Past President 2014-2015; Psonya Hackett, West TN At Large Board Member; Heather Gavrock, LAW Anne Schneider Board Member; Amy Farrar, MTLAW Board Member; and Katie Blankenship, CLE Committee Chair. Pursuant to TLAW’s Bylaws, additional nominations for these positions(except for President) may be made from the floor of the Annual Meeting prior to the call to vote. Please mark your calendars and plan to attend TLAW’s Annual Meeting & Breakfast on Friday, June 15, 2018, at 7:00 a.m. Central Time, at The Peabody Hotel in Memphis, TN. If you cannot attend, stay tuned for more information about voting by proxy. Additionally, if you want to become involved in TLAW next year as a Committee Chair or Committee member, email President Elect Holly Renken. There's always room for leaders! TLAW’s new year is fast approaching. Are you interested in becoming more involved? Do you know someone who would make a good TLAW leader? Help us continue to move TLAW and its efforts forward! TLAW is seeking nominations for the following positions on the 2018-2019 Board of Directors for terms beginning on June 16, 2018. Board members attend monthly board meetings conducted by phone. Board members may miss no more than two board meetings per calendar year. To learn more about who's currently serving in these roles, visit this page, and to learn more about the responsibilities of each role, read our bylaws here. There are also many opportunities to become involved in TLAW committees. All nominees must be current TLAW members. Not a member? Join here. The deadline to submit nominations is April 26, 2018. Nominations may be sent to our Nominating Committee at the following email addresses: Holly.Renken@TN courts.gov and kcrutchfield@wimberlylawson.com. The Nominating Committee will present its report and recommendations to the President and Recording Secretary on or before May 15, 2018. The President Elect becomes the President of TLAW in FY 2019-2020. TLAW Wins Award for Empowerment Conferences! The National Conference of Women’s Bar Association (NCWBA) has chosen the Tennessee Lawyers’ Association for Women (TLAW) as the recipient of the NCWBA’s 2018 Outstanding Member Program Award for TLAW’s groundbreaking work on its Empowerment Conferences. Several years ago, the TLAW Board of Directors recognized that the position of women in the legal profession has advanced since TLAW was founded, but the same concerns that gave rise to TLAW still exist today. Moving a greater percentage of women into elective office, the judiciary, chief corporate counsel, and law firm leadership is still challenging, with obstacles such as bias and the leaky pipeline keeping women from achieving their full potential. 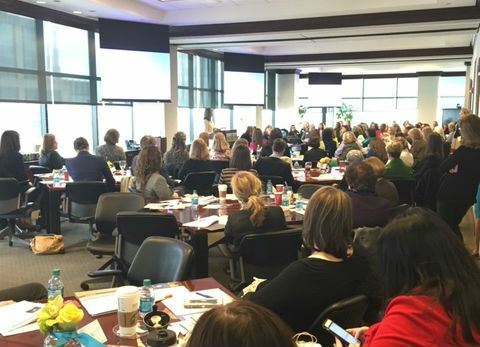 The Conference was created as a way to address the need for further progress of women in the profession and to serve as a catalyst for continued efforts by women across Tennessee to increase female presence at the highest levels of the profession in the public and private sectors. The inaugural Conference was held in 2016. The 2017 Conference was held in conjunction with a national judicial conference. The evening before each Conference, there is a networking event for speakers and attendees. 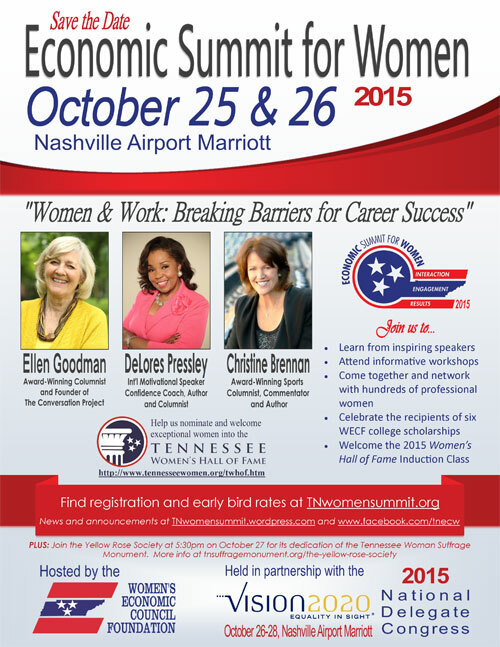 The caliber of speakers at the Empowerment Conference is unmatched in Tennessee. Accomplished attorneys and judges provided insight about running for elected office, leadership at law firms, ethical considerations for in-house attorneys, retention in the legal practice, the path to partnership and more. 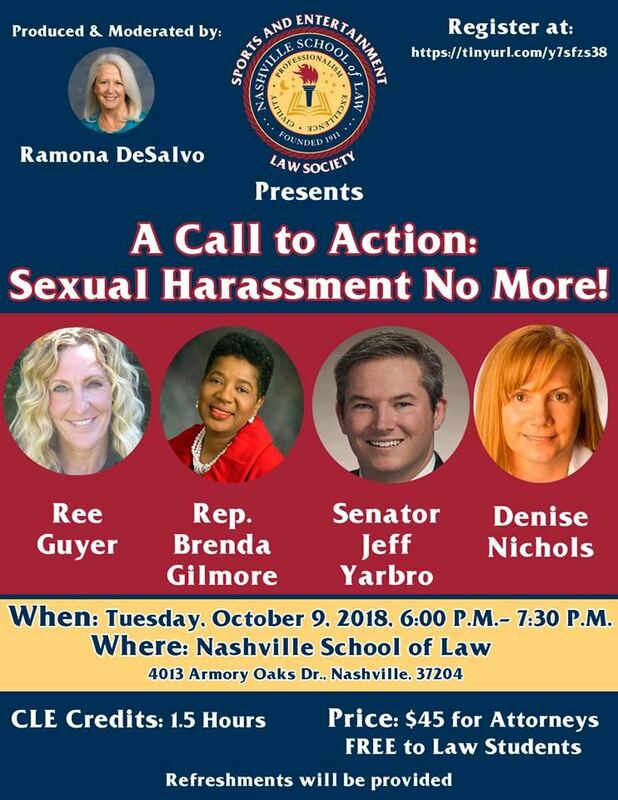 This program is the first of its kind in Tennessee and has been duplicated in a shorter form by women's bar organizations in Nashville and Memphis. The NCWBA Award recognizes innovative projects, programs, and services for organization members or the bar. TLAW is proud to be recognized for the Conference, which provides invaluable opportunities for women lawyers in Tennessee. The Award will be presented to TLAW at the NCWBA’s national Women’s Bar Leadership Summit, which will be held on Friday, August 3, 2018 in Chicago. If you want to attend TLAW’s award-winning Empowerment Conference, registration is now open for this year’s Conference, themed Right Time, Right Now! More information and registration are available here. Empowerment Conference Co-Chair Kyonzte Hughes-Toombs moderates a panel at the Empowerment Conference 2017: Women Who Win! There may be parking in the garage underneath the building or in the surface lot immediately south of the building on 6thAve., North. Otherwise, there are garages and parking lots nearby. This program will explore many aspects of Nelson Mandela's biography, with particular emphasis on his training and development as a lawyer. It will also describe how President Mandela practiced the skills of lawyering throughout his entire life. The talk will also focus on the deep spiritual life that Nelson Mandela developed, and how this inner life continually impacted his lawyering skills as well as who he was as one of the greatest individuals of the 20th Century. Lawyers can be humanitarians in addition to being advocates. To be an effective lawyer, one must stand in the shoes of the client and understand what is important to them. A lawyer's overarching duty to the client, court, and public requires a burning commitment to the moral underpinnings of the legal profession, and consciousness of the economic, social, and political factors that shape the world. The program will connect Nelson Mandela’s life with today’s Rules of Professional Conduct, to show how they are relevant to each of us. Bill Manning practices business litigation, intellectual property litigation and personal injury litigation, concentrating in the manufacturing and technology industries. Among many professional accomplishments, he has been appointed Chair of a Magistrate Selection Committee, three times to a Federal Court Magistrate Selection Committee and twice to a Magistrate Reappointment Committee. He was previously appointed to the Minnesota Federal Court Federal Practice Committee. Register here or Call 615-242-9272. If you prefer a physical registration form, you may download one here to submit with payment to the NBA. The proposed slate: Last month, TLAW announced the slate of officers for the upcoming 2017-2018 TLAW year. You can review the slate here. How to vote by proxy: You will need to choose a proxy to cast your vote. You may choose any other TLAW member by filling out this form. You may also choose President Ramona P. DeSalvo as your proxy by filling out this form. Please email completed forms to Sonia Boss at soniajboss@gmail.com. Call for Nominations for TLAW's 2017-2018 Board of Directors! TLAW is seeking nominations for the following positions on the 2017-2018 Board of Directors for terms beginning on June 16, 2017. Board members attend monthly board meetings conducted by phone. Board members may miss no more than two board meetings per calendar year. To learn more about who's currently serving in these roles, visit this page, and to learn more about the responsibilities of each role, read our bylaws here. All nominees must be current TLAW members. Not a member? Join here. The deadline to submit nominations is May 10, 2017. Nominations may be sent to our 2017 Nominating Committee, made up of Ramona P. DeSalvo, Holly Renken, Karen Crutchfield, and Connie Chadwick. Please email the Nominating Committee at the following email addresses: rdesalvo@desalvonashville.com; Holly.Renken@TN courts.gov; kcrutchfield@wimberlylawson.com; connie@chadwickandtignor.com. The Nominating Committee will present its report and recommendations to the President and Recording Secretary on or before May 15, 2017. *Please note that nominees for President-Elect must be from one of the following counties: Benton, Carroll,Chester, Crockett, Decatur, Dyer, Fayette, Gibson, Hardeman, Hardin, Haywood, Henderson, Henry Lake, Lauderdale, Madison, McNary, Obion, Shelby, Tipton, or Weakley. The President Elect becomes the President of TLAW in FY 2018-2019. TLAW's 2016 Empowerment Conference was a Huge Success! In April 2016, TLAW hosted an Empowerment Conference with the theme Great Expectations. Women from across the state participated in the Conference. Thank you to all of the attendees, speakers, and sponsors of this fantastic event. TLAW extends a special thanks to keynote speaker, Gwen K. Young, of the Wilson Center's Women in Public Service Project. The Conference provided attendees with education and valuable insights presented by members of the legislature, judiciary, and other governmental representatives on how to prepare oneself for an elected or appointed position. The Conference also included a panel of attorneys in general counsel positions providing the perspective of the “in house” attorney and advice for “outside counsel” working with corporate counsel and a panel of experienced attorneys presenting on leadership in various contexts. You can view the full schedule of the conference here. CLE materials from the conference are available here. Pictured above (L to R): TN Supreme Court Justice Holly Kirby, Jackie Dixon, TN Supreme Court Chief Justice Sharon Lee, Nashville Mayor Megan Barry, and Administrative Office of the Courts Director Debi Taylor Tate. Tennessee Supreme Court Justice Cornelia A. Clark was the keynote speaker at the Vision 2020’s Conference when the group met recently in Nashville for their Vision 2020 Fifth National Congress. Vision 2020 was founded at Drexel University and is a national coalition of organizations and individuals united in their commitment to achieve women’s economic and social equality. The group’s goal is to accelerate the pace of women's progress toward full equality by the year 2020, when the nation celebrates the 100th anniversary of women's voting rights. Justice Clark noted that she was “energized and uplifted by the goals of the organization and the collective power of the women from around the country who are leading it." A large portion of the conference in Nashville was devoted to the women’s suffrage movement. “The choice of Nashville as Vision 2020's mid-decade site demonstrated our respect for the historic contribution Tennessee suffragists achieved when their state became the 36th and last state needed to ratify the 19th Amendment in 1920,” said Lynn H. Yeakel, founder and executive director of Vision 2020. 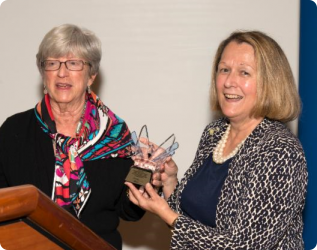 Justice Cornelia A. Clark receives the Pioneer Award from Lynn H. Yeakel, founder and executive director of Vision 2020.